• There are 49 rooms and 16 suites. • Somerset Maugan bar, the Club Dauphin restaurant, the Cap (1* Michelin) restaurant and the Winter Garden restaurant. • 4 meeting rooms for up to 150 people and 750 m² spa, indoor swimming pool and spa gardens, sea water olympic sized outdoor pool overloooking the Mediteranian. • Located right on the End of the Cap Ferrat, between Monaco and Nice, panoramic view over the Mediteranian Sea. • 1895: King Leopold of Belgium sells part of his vast property to Mr Péretmère, 6,5 ha are destinated to be the parc of the future Hotel. • 1908: Opening the Grand Hotel du Cap. • 1920: The Grand Hotel is bought by Madame Ferras. former Holiday resort for Queen Victoria, Winston Churchill. The famous Somerset Maugham and Sao Schlumberger were the neighbours and friends of the Hotel bar. 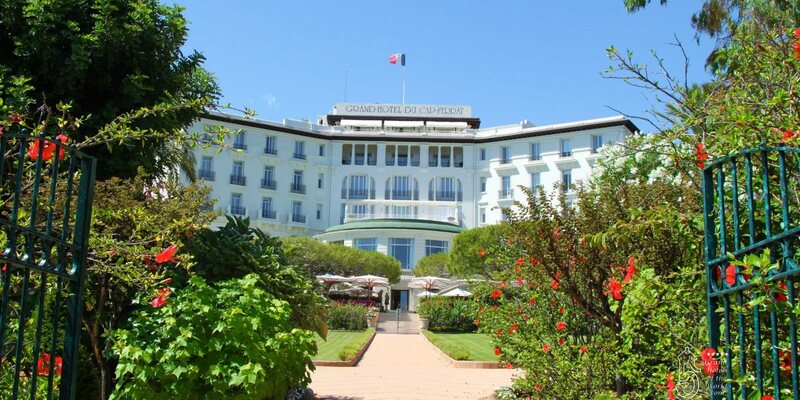 • 2011 May 5: Grand Hotel du Cap receives the new official Label « Palace ***** » given by the French Ministy of Tourism to describe a new elite categorie of 5 Star Hotels in France. Unlike Grand Hotel du Cap not every French « Palace » is part of « Palace Hotels of the World.com », as some do not have enough historic background to be listed.